Cable-Trol® Rodless Cylinder & Cable Cylinder Lines offers a cost effective solution compared to other rodless cylinder types. Cable cylinders provide the same stroke as conventional air actuators with pneumatic pistons with about 50% SPACE SAVINGS. As the piston is pushed in one direction, the load is pulled in the opposite direction within the length of the cylinder. Effective piston area is greater than in conventional rod cylinders and there is equal force in both directions. Our rodless cylinder and cable cylinder lines work in a variety of applications such as remote location, rotary motion and around corners. Making Cable-Trol one of the most versatile space saving cylinders on the market! 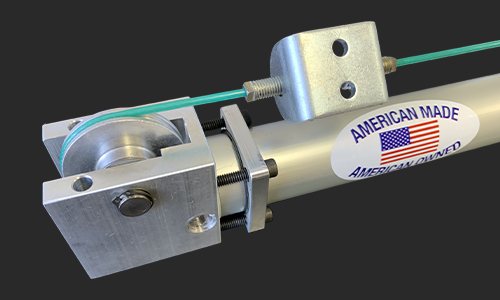 Cable cylinders can be configured to a variety of positions and ports along with a wide selection of accessories including Automatic Tensioners, Flange Mounts, H-Trolley's, Reed Switches, Magnetic Pistons, Cable Wipers and More. 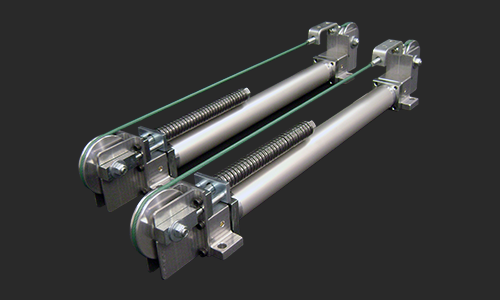 At Greenco we offer many cable cylinder designs including single acting pneumatic cylinders and double acting pneumatic cylinders. We also manufacture various custom cylinders, call us with your application today!